Our featured guest artist, George Pope! Many thanks to Altus for making George's appearance possible! Carmen Bannon currently plays flute with the Sarasota Orchestra, Charlottesville Opera in the summer, and extra/substitute with the Florida Orchestra and Orlando Philharmonic. Previously she played extra/substitute with the Oklahoma Symphony. She began playing the flute at age 7 taking lessons from her dad, Harry T. Newell, who was a life-long professional musician. Later she studied with Carl Hall (piccoloist with the Atlanta Symphony), Martha Rearick, Keith Bryan, Christine Smith and Peter Lloyd. She was a member of the flute group inspired by the flutist Trevor Wye called "Wyes Guys", later renamed "Tour de Flute" which performed at various National Flute Conventions, but also toured Mexico. Sarah Biser received her Bachelor of Music Performance degree from Gordon College; she continued her studies at Gordon-Conwell Theological Seminary where she received a Master of Church Music. In 2010 Sarah began her studies in flute repair earning certificates in Padding, Overhaul and Mechanical Techniques and Build Your Own Head Joint from the Vermont Guild of Flute Making, Inc.; she did further studies at J.L.Smith Company and is a certified Straubinger pad technician. Sarah is the owner of Biser Flutes LLC where she provides Overhaul, COA (Clean Oil and Adjust), and minor repair work for flute, piccolo, alto and bass and teaches private lessons. Colleen Blagov has been Principal Flute of the Orlando Philharmonic Orchestra since 2006. She has also held orchestral positions with the Savannah, Charleston, Louisville, and Columbus (OH) Symphonies. Colleen is often a featured soloist with the OPO and is on the music faculty of Florida Southern College. She holds degrees from Ithaca College and the Cleveland Institute of Music. Taylor Irelan is owner of The Tampa Flute Studio and is an active freelance flutist and composer. He has worked with composers such as Thea Musgrave, Wil Offermans, and Ian Clarke on their music, including a performance of Musgrave's Chamber Concerto No. 2 for the BBC Symphony Orchestra's Total Immersion Project which was recorded and broadcast on BBC Radio. As an orchestral flutist, he has performed with the London Symphony Orchestra, Jacksonville Symphony Orchestra, Pueblo Symphony Orchestra, London Graduate Orchestra, and the Hot Spring Music Festival Symphony Orchestra among others. He is also the Director of the Gulf Coast Flute choir and flute instructor of the Golden Isles Youth Orchestra summer festival. He received his Masters of Music in Performance and Orchestral Artistry from the Guildhall School of Music and Drama, and his Bachelors of Music from the University of North Florida. His primary flute teachers were Ian Clarke, Philippa Davies, Sarah Newbold, Rhonda Cassano, and Les Roettges. Darbi Lamrani lives in Southwest Florida where she is an active flutist, private teacher, and music educator; she is currently the Choral Director & Assistant Director of Bands at Paul Laurence Dunbar Middle School in Fort Myers, FL. Darbi holds a Bachelor of Music degree from the University of Florida and a Master of Music degree from Baylor University. She has performed in orchestras both in America and in Europe and continues to perform with local orchestras, churches, and musical theater groups in Southwest Florida. Amanda Lyon is a flutist and music educator in Pinellas County School District. She has two degrees in music performance and pedagogy. She is the piccoloist of the Tampa Bay Symphony, principal flute of South Shore Symphony Orchestra, and an active member of the flute chamber group, FluteAmici. Amanda has been teaching flute for almost fifteen years. Her students have gone on to earn degrees in music as well as other disciplines like computer engineering and science. She is happy to be here to perform and serve the local flute community. Pianist Dana Milan received a Master of Music in instrumental accompanying from Florida State University and a DMA in vocal accompanying and coaching from the University of Illinois, where she studied with John Wustman. She has been on staff at several colleges in the Indianapolis area and currently serves as staff accompanist for the University of South Florida. She has worked with numerous opera companies including the Indianapolis Opera, St. Petersburg Opera, and the Utah Festival Opera. Other past experiences include being the recital accompanist for the Wildacres Flute Retreat in North Carolina for four summers. This past summer she joined Kyoung Cho and her students to perform in the Assisi Performing Arts festival in Assisi, Italy. Besides piano, Dr. Milan earned a performance certificate in harpsichord from Florida State and continued her studies on harpsichord and organ at the University of Illinois. Barbara Prescott received her Bachelor of Music Performance degree from the University of Wisconsin, where she was a student of Robert Cole. After graduating, she studied with Donald Peck on a Chicago Symphony scholarship and was principal flute in the Civic Orchestra of Chicago. She has also studied in master classes and seminars with Marcel Moyse, Jean-Pierre Rampal, and Doriot Dwyer. Currently, she is a faculty member at St. Petersburg College, Eckerd College, the University of Tampa, and Pinellas County Center for the Arts. Kimberly Rini studied flute with Martha Rearick at the University of South Florida from 1991-1994 and appeared in masterclasses with Susan McQuinn, Angeleita Floyd, Peter Lloyd, Alexa Still and James Galway. She has performed with the Charlotte Symphony, Florida Orchestra, Tampa Bay Symphony and Suncoast Symphony; with Il Divo, Irish Tenors, Celtic Thunder, Celtic Woman, Amy Grant, Michael W. Smith, Natalie Merchant, Indigo Girls, Frankie Valli & The Four Seasons, Kansas, Roger Hodgson/Supertramp, Dennis DeYoung/STYX, Little River Band, Rocktopia, The Music of Led Zeppelin, The Music of Queen, Legend of Zelda: Symphony of the Goddesses, Video Games Live, Disney in Concert, Cirque du Soleil, Harry Potter & The Sorcerer’s Stone; the national Broadway tour of The Sound of Music; on NBC with Mannheim Steamroller and Martina McBride; and recorded with Michael Bolton for his Symphony of Hits tour. She has been teaching flute privately since 2002 and her students have earned acceptance as music majors with scholarships to Boston University, Florida State University, University of Florida, University of Central Florida, University of North Florida, University of South Florida and University of Tampa, and the Tanglewood Institute. Kimberly holds a Bachelor of Arts from the University of Notre Dame and a Master of Arts from Columbia University's Teachers College. Dr. Mandy Swaim is currently Adjunct Professor of Flute at Hillsborough Community College and is an active flute instructor in numerous secondary schools throughout the Tampa Bay area. She also maintains an active studio of beginning to advanced students outside of her work in the school system. 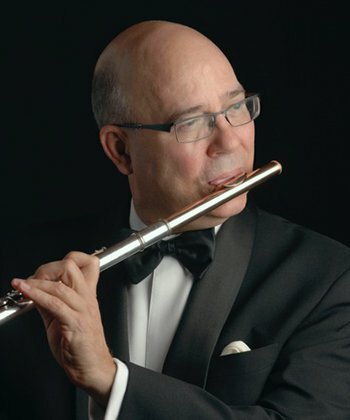 Additionally, Dr. Swaim is the principal flutist of the Tampa Bay Symphony, and has collaborated with numerous groups across Tampa and St. Petersburg including, the St. Petersburg Opera Company and Florida Wind Band. She holds a Doctor of Musical Arts and Master of Music Degree from the University of North Carolina Greensboro and a Bachelor of Science in Music Education from the University of South Florida.